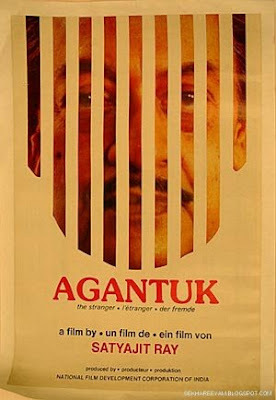 The final movie of Satyajit Ray, a giant in Indian, as well as, world cinema, Agantuk beautifully portrayed the distrust and paranoia that have become parts of urban social fabric and milieu. The movie, adapted from a short story from Ray himself, is about the unexpected arrival of a long-lost uncle (Utpal Dutt), who had left home at a young age in order to lead the life of a wanderlust, into the lives of an upper middle-class Bengali family (played by Dipankar Dey and Mamata Shankar). The repercussions of his return, after 35 years of complete absence, makes the family traverse the complete cycle of distrust, dilemma, redemption and contentment. The swansong of the master auteur also ironically tells us, that howsoever much might we know the genius (Ray, or for that matter, any artiste), the man behind the social veneer would always remain a stranger to us all. The movie was also a swansong for the veteran thespian and one of the most versatile actors ever to face a camera in India, Utpal Dutt, who played the eponymous role of the stranger. The evolving character dynamics between the three principal protagonists as also the couple’s young son and their inquisitive friends (both Rabi Ghosh and Dhritiman Chatterjee provided interesting cameos), have been exceptionally well covered – with subtlety as also with conviction, in this gently paced and wonderfully enacted movie. The movie – in equal portions an affecting drama and a light comedy – also provided a number of probing questions on what constitutes a civilization and what it means to be a part of the human race – covered through a number of powerful dialogues. 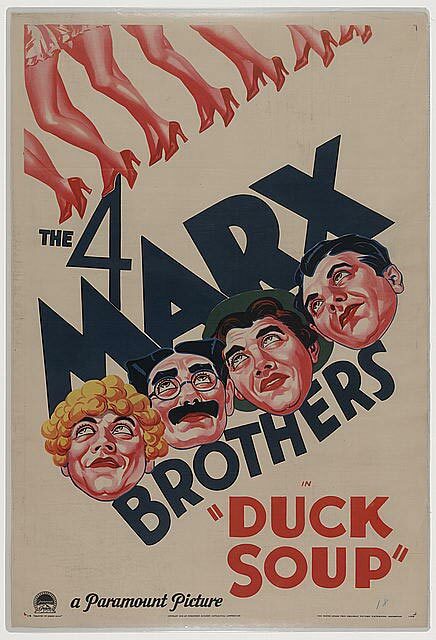 Duck Soup is often cited as the greatest work of the inimitable Marx Brothers. Brisk to the point of keeping one off-guard right through its crisp length, this was a madcap political satire on warmongering dictators – the kind of people who were especially in vogue when the movie was made. This unapologetically irreverent, outrageously funny, and incredibly witty movie is set in a fictitious country called Freedonia which is nearly broke. The country’s principal benefactress agrees to donate money to save the country, and in return the wisecracking Rufus T. Firefly (Groucho Marx) is made its President. Chicolini (Chico Marx) and Pinky (Harpo Marx) are two bumbling spies sent by the ambassador of the neighbouring country Sylvania, but end up becoming parts of Freedonia’s army when war breaks out between the two countries. The brilliant and acerbic one-liners delivered by Groucho in his unique style, as well as the movie’s various plot elements in general, lampooned everything on sight and beyond. 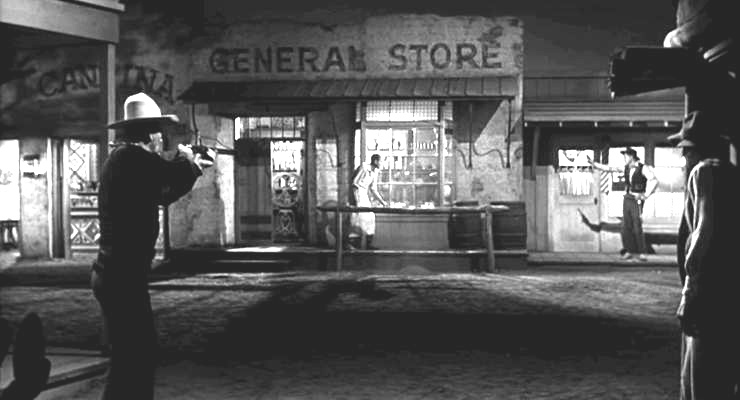 And some of the gags it is filled with are worth their weights in gold – the extended mirror pantomime sequence could very well feature amongst the most astounding and ingenuous sequences ever concocted and captured on a motion picture camera. The three brothers, at times, seemed to be in a zone of their own. The degree of farce and slapstick did at times dilute its underlying theme, but it remains a landmark film for its no-holes-barred indictment on the absurdities of war, as also for its sheer entertainment quotient. John Ford reveled in the making of Westerns, for what is The Man Who Shot Liberty Valence if not an expression of his love affair with the genre? With its overarching themes of nostalgia and melancholia concerning the slow but sure demise of the iconic landscape, the movie remains a heartfelt and elegiac tone-poem to it. A popular US senator Ransom Stoddard (James Stewart), to the immense surprise of the local journalists, has made an unlikely stop at a dusty, godforsaken town with his wife Hallie (Vera Miles), in order to attend the funeral of one Tom Doniphon (John Wayne). Upon the press-men’s insistence, Stoddard recounts his unlikely stopover in this town, through sheer circumstances, many years back; his love-hate friendship with Doniphon, one of the last true symbols for everything that the West stood for – ruggedness, courage and honour; and the events leading to and following the creation of a legend, that of the shooting down of the notorious outlaw Liberty Valence. The tales of the two principal characters have been exceptionally juxtaposed to provide a sense to the direction America took at the turn of the 20th century – while Doniphon, for all his machismo, charisma and larger-than-life persona, slowly disappears into anonymity and obscurity, Stoddard, despite being so out of place, even anachronistic, as a law-abiding citizen in the frontier town, goes on to become an all-American poster boy. Though not without its share of over-dramatizations and some clichéd tropes, this elegantly-paced and well-acted film does stand on its own as a superb Western. Martin Scorsese seemed to have been losing his touch through most of the 90’s and 2000’s (the documentary No Direction Home was perhaps the sole exception). 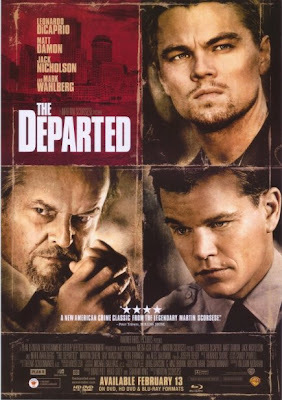 With The Departed he made a spectacular return to the kind of high-voltage and pulsating gangster movies he last attempted with Goodfellas and Casino. Gritty, edgy, hyper-violent, unabashedly profane, terrific use of background score, the city playing a vital role in character-building – it sure seemed like a work by the Marty of the old. An American rendition of the popular Hong Kong undercover-cop thriller Infernal Affairs – the movie is set in the Irish-Catholic milieu of Boston. 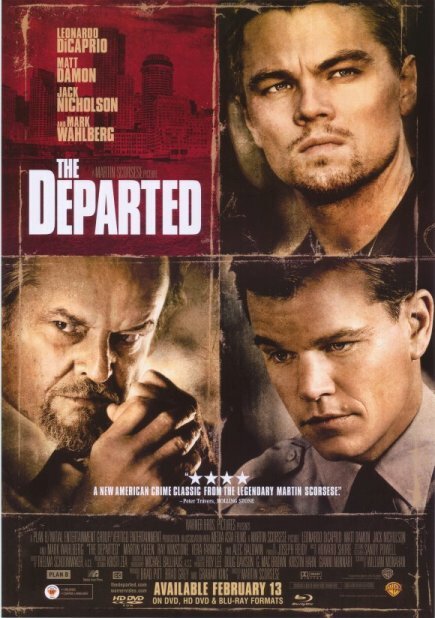 The labyrinthine plot goes as follows: Billy Costigan (Leonardo DiCaprio), who’s freshly out of the police academy, is coaxed by his bosses (Martin Sheen and Mark Whalberg) into becoming a “rat” in the outfit of the psychotic and powerful mobster Frank Costello (Jack Nicholson); meanwhile Collin Sullivan (Matt Damon), who was handpicked at a young age by Costello, has managed to infiltrate the Boston police force; and thus starts an arresting game of cat-and-mouse. A tale of shifting and dubious loyalties and identities, this compelling and visceral character-study is reminiscent of the kind of gang violence and street justice Scorsese unforgettably portrayed in Mean Streets. Nearly everything worked for the movie – powerhouse performances by the superlative ensemble cast, kinetic and near-flawless script filled with darkly funny irony, exceptional editing (the movie managed to proceed at a frenetic pace without ever resorting to over-editing), great buildup of mood and tension – thus making this, the cover version, far superior than the original itself. 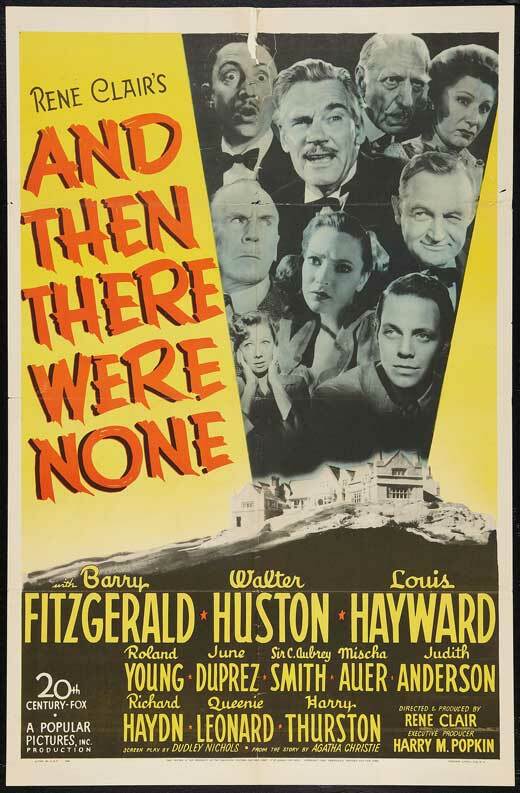 Adapted from The Ten Little Indians, the enormously popular novel by the legendary British mystery novelist Agatha Christie, Rene Clair’s And Then There Were None provided a classic template that has been used and rehashed numerous times over. The brilliant and ingenuous plot dealt with the bumping off of each of ten strangers who’ve assembled on an island one by one – possibly by someone who’s part of that motley group. Each of the ten people has some dark and violent past, thus making the carefully orchestrated murders acts of extra-judicial punishments for their sins. To make matters more interesting, the popular and grotesque nursery rhyme that formed the basis for the titles of both the book and movie is followed almost like a ritual by the mysterious judge, jury and executioner with cold and ruthless precision. Technically or as a piece of art the movie might not have been groundbreaking, but that’s not to say the movie was short of merits – rather far from it. 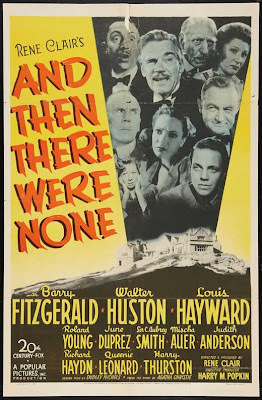 Though the narrative never moves at the kind of breakneck speed today’s thrillers tend to, the elegant pacing worked very well by ensuring slow but quietly engaging buildup of suspense and mystery. Though some of the performances do border on the theatrics, on the whole the movie was well enacted, especially by the excellent character actor Barry Fitzgerald as an odd-looking former judge with a sinister smile perpetually attached to his face, among others. Interestingly, the director was loyal to the source material for most parts, but chose for some drastic deviations for the finale. Though not a samurai film per se, the kind of movies Japanese maestro Akira Kurosawa is most renowned for, his High and Low essentially propounded similar themes of courage, heroism and high tragedy. 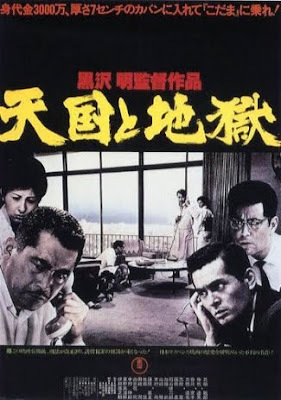 Adapted from the novel King’s Ransom by Ed McBain, this police procedural was made in the tradition of a film noir, but with enough cultural detailing thrown in to make it a quintessentially Japanese movie. The plot concerns Gondo (powerfully performed by Toshiro Mifune), a wealthy corporate honcho whose chauffeur’s son gets kidnapped mistakenly (the kidnapper's intent was to abduct Gondo's son), and he ends up putting his professional and even personal life at stake by agreeing to a hefty ransom demand. The first half of the movie deals with the debilitating emotional dilemma faced by Goldo, while the second details the massive manhunt launched by the cops. The sharp black-and-white photography and the sparsely used soundtrack did a fine job at complementing the ambiguity of the characters and the psychological nature of the plot. Despite the potent socio-cultural commentary and detailed deconstruction of the crime investigation, the movie dragged a bit at times – resulting in flagging of interest in the middle sections. Further, the final denouement, by being too fatalistic, didn’t leave too lasting an impression. Interestingly, this was remade into a Hindi movie released in 1978 called Inkaar, which too was a reasonably good police procedural.